I cannot say enough good things about today’s sambar recipe. It has never let me down and its my favorite ever since I chanced upon Hemantji’s sambar podi. The key to a good aromatic sambar is ‘sambar powder’ and the vegetables that go into its making. 1 Pressure cook dal with 2 cups of water and a pinch of hing. Once pressure cooked, mash, add 2 cups of water, shallots, bottle gourd pieces and turmeric pwd. Bring to a boil, reduce flame and cook for 8-9 mts on low to medium flame. 2 Once vegetables are half cooked, add the tamarind extract, salt and jaggery and bring to a boil. Reduce heat and let it simmer for 12-14 mts, till the rawness of the tamarind disappears. 3 Add the sambar pwd and combine well. Let it cook for another 6-7 mts. 4 Heat oil a separate pan, add the mustard seeds and let them splutter. Add hing and red chillis and roast for a few seconds. Donâ€™t burn them. Lastly add curry leaves and immediately add to sambar. 5 Turn off heat and place lid. Keep covered for at least an hour and garnish with fresh coriander leaves. 6 Serve with tiffins or hot steamed rice and appadam (papad). Alternatively, you can pressure cook the vegetables with little water in a separate container. Vegetables like chow chow, drumsticks, lady’s finger, carrots, radish and brinjals are also welcome. Sailu garu Sambar chala bavundi….mouthwatering!!! When do you add tomatoes? I have been reading your blog for a longtime and I have also tried some recipes which were really good. I was just browsing today’s Eenadu newspaper and saw you rice rava upma picture (looks like the stole it from your website). Lazy people, they have no creativity or originality. Just wanted to bring it to your notice. Thanks for taking the time to inform me, Sharada. Can we use pumpkin? after pressure cooking the vegetables separately, do we mix them with cooked dal, add tamarind water and follow your recipe in the same way? I think fresh curry leaves is also important to get that aroma along with this special sambar powder. Yes, you can use pumpkin too. Let the mashed dal and tamarind water boil till the rawness of tamarind almost disappears, add the cooked vegetables, cook for another 3-4 mts and follow the rest of the procedure. Yes, fresh curry leaves give that ‘oomph’ to sambar. the sambar pic is very inviting. i learned to cook sambar from my dance teacher who was from Kerala. i also love to add lots of veggie to it. Picture looks very inviting. Can you post vegetable biryani recipe, if possible? as well as both samayal and photography, Sailu. First I want to thank you for ur creativity, precise measures, instructions, presentation and all little details, also very helpful for starters and of course for everybody. I made several sambar powder recipes. I don’t know what things went wrong, I couldn’t get good taste. I am going to try yours. I follow the same recipe. I just add half spoon of ghee while seasoning which takes the sambar to another level. Absolutely right. I add ghee for seasoning. Infact I have mentioned above in the recipe that ghee can be used for seasoning. you know i used to do that but then one of my aunts from coastal andhra suggested coconut oil and since then i’ve never used anything else… I knwo a lot of people get the creeps about coconut oil but trust me it tastes amazing…!! Hardly prepare sambar at home….& this lauki sambar looks good. Thank you for posting this recipe. and your writing conveys your enthusiasm for this recipe. Since M is currently in India with meera, I don’t make any elaborate dishes, but this is something that even I could do. Now I know what I’ll be having for dinner! The recipe seems easy, but one question, Do we add tomatoes while boiling the dal or … Please let me know. You can add tomatoes at the time of adding the tamarind extract. Was thinking of making sambar today. Thanks for posting this new recipe.. will try this today..
it came out with a great taste. thank q for a wonderful sambar recipe. You did not give preparation of home-made sambar podi, Sailu. Pl. update it again if you can. thank you. I am a regular visitor to your blog and tried many recipes, which turned out really wonderful. recently i have noticed that in eenadu news paper there is a picture of your brown bread pizza. I just want to inform you. 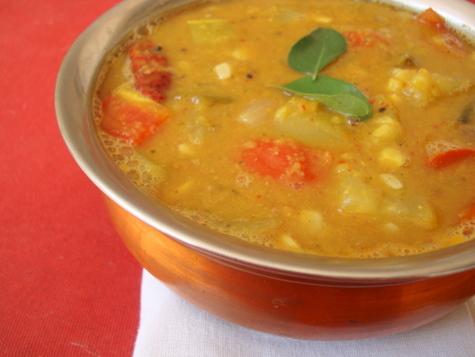 i prepared sambar quite a few times, but it turned out to be some thing else. 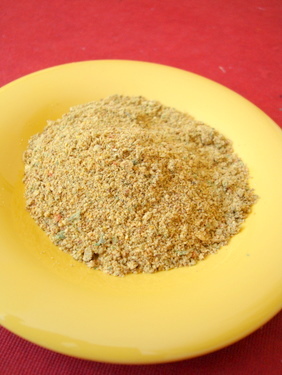 Tomorrow planning to try your sambar and today i have already prepared your sambar powder. Thanks for informing me, Lohi. They have not taken my permission before using the images. 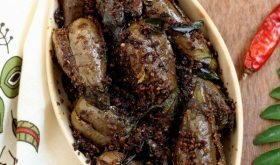 You can add them just before adding sambar powder. After the rawness of tamarind is slightly reduced, add the tomatoes, cook for 3-4 mts and then add the sambar powder. Sailu: Your recipe using tomatoes and tamarind is excellent. But for Ayurvedic reasons, I would like to avoid tomatoes and tamarind. What do you have to say? Also, I wonder if, and how, I can add drumstick leaves to this preparation. Thanks. 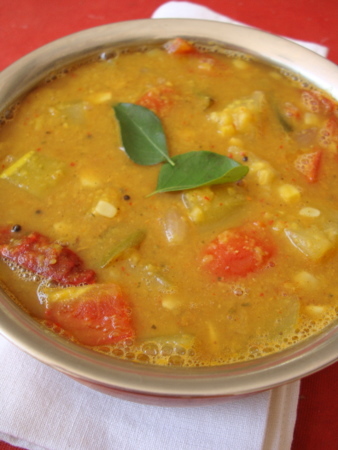 Sambar needs a tangy flavoring agent like tamarind or tomatoes or raw mango powder. If you were to omit them, you can still make a tasty dish using drumstick leaves. Yes, mango powder (and I am thinking, lime/lemon juice, too in this context) would be the Ayurvedically accepted alternative. How much of it, Sailu? And when should it go in? Besides, I would like to scale down the quantity to feed 2-3 rather than 4-5 people. That way, I can prepare the dish for us two people, fresh daily, enabling me to keep changing the vegetables. thanks for the recipe ..on sunday i tried out this and it turns really in to a great dish. earlier i dont know how to make sambar , but with ur help i can do it ..
i am 6 months pregnant nw and i enjoyed the dish a lot after many days …………. I just made this for the second time with fantastic results. Such a wonderful (and to me, once mysterious) complexity of flavors with an indescribably alluring aroma! The first time I used a lemon-sized ball of tamarind and it came out way too sour. I then realized that Indian lemons must be quite a bit smaller than New York City ones and I used a golf ball-sized piece of tamarind pulp this time. I don’t have a pressure cooker so I soaked the toor dal for half an hour, simmered it for 30 minutes and used a whisk to blend it. I had never used bottle gourd before, but luckily there is an very well stocked Indian spice store/grocery with in the neighborhood that had some real beauties. And fresh curry leaves! I decided to try to make some phulkas (using a small cast iron skillet) to go with the rice after watching a few Youtube vids and they actually came out great–almost all of them puffed up nicely and were really tasty. I have made many, many different Indian dishes over the years but this was perhaps the best. It completely captured the delicious sambar flavors I remembered from my time in Singapore some years ago. You are most welcome, Teddy. Am so happy you could re-create a dish that brings back good food memories. Thanks so much for taking the time to comment and the positive feedback. I tried this yesterday and it was so reminiscent of my Amamma’s Sambhar! Felt like I was back in Vizag eating it at home. The fresh sambhar powder makes all the difference. Well worth the time! Thanks for posting this with detailed instructions. Made this yesterday and it came out Fantastic! The fresh sambar powder made all the difference! Made sambar powder as per your recipe.Sambar tasted great but was thick. Not sure if others had this issue. My sambar could do with some more water. Or is it supposed to be of thick consistency?